Fabio Cannvaro's head-in-hands reaction to Italy's collapse during the World Cup in South Africa seems so long ago now. Italy's 1-0 win over Slovenia on Tuesday clinched their place at Euro2012 next summer with two games remaining. A team that looked irredeemable just a year ago has been revived by Cesare Prandelli. Admittedly, there was little chance that Prandelli could do worse with Italy than Marcello Lippi had during the previous World Cup. Italy's sojourn in Africa during the summer of 2010 was not even characterized by the drama that usually accompanies their campaigns. After all, even when they lose, the Azzurri find a way to register on a tournament. Take for instance the 2002 World Cup loss to South Korea. Even allowing for the fact that South Korea were hosts who had careered past Poland and Portugal in the group stages, no one expected Italy to stumble during their second round clash given that they were starting with the much vaunted trident of Christian Vieri, Alessandro Del Piero, and the consummate enigma, Francesco Totti. As it turned out, however, Italy lost 2-1 to a golden goal, and Totti, who had seduced coach Giovanni Trapattoni enough for him to liken the Roman's talent to Vincent Van Gogh, did little before being controversially sent off by the now disgraced referee, Byron Moreno. The acrimony surrounding the patently scandalous refereeing detracted from Italian shortcomings in general. Italian failure was accommodated by an almost unanimous appeal by journalists and fans to the conspiratorial. Italy were defeated, but they weren't about to indulge in any drawn out, profound inquests. They exited the stage with a flourish, and strident cries of "foul." In contrast, conspicuous by absence during their performances at the World Cup in South Africa was a pulse. Italy looked spent. It wasn't only the fact that Fabio Cannavaro was long, long past his Berlin self, or that it was mystifying how Simone Pepe had a starting berth; it was more that the performances illuminated how anachronistic a modern man like Lippi could be. His faith in the tired and weary was one thing; it was how he obdurately stuck to those selections that was so maddening. For a man who earned not an insignificant portion of his renown for meticulous attention to detail--a disposition even evident in his garb--Lippi did the big things wrong. The fact that he had won the World Cup four years earlier gave him credibility that was ultimately misplaced. Italy exited the World Cup without winning a single game--something that no Italian team had done previously. When Prandelli came into the frame, enthusiasm for the national team was low. The belief that had gained currency was that the Italian generation of players was simply not good enough. It was a belief prompted partially by the despair of South Africa, but also because the defence, something that most Azzurri sides could always boast, looked the most unsettling part of the team. Juventus's Giorgio Chiellini, the mainstay in the back four, is the standout defender, but he is not nearly at the level of Alessandro Nesta or Fabio Cannavaro in their prime. Yet, he provides the solidity and the hard-nosed attitude that Prandelli wants. It is around his towering presence that Prandelli has moulded his defence. Chiellini has started every single game of the Euro2012 qualifiers, but around him a varied cast of defenders have come and gone. His partner for the last three games has been Inter's Andrea Ranocchia, who took over from Chiellini's Juventus teammate, Leonardo Bonucci. The full-backs have changed frequently with the likes of Gianluca Zambrotta, Cristian Molinaro, Mattia Cassani, Federico Balzaretti, Domenico Criscito, Christian Maggio, and Lorenzo De Silvestri having all started at some point during the qualifiers (incredibly, this list does not contain Milan's Ignazio Abate, which tells a lot about how exaggerated claims of a chronic lack of decent defenders are and were). However, and this fact redounds to Prandelli's acuteness as a coach, despite the changes, Italy only conceded one goal during the qualifiers (it should be noted, the game against Serbia was awarded 3-0 to Italy after fan violence, but a remarkable statistic nonetheless). Prandelli may not have been able to rely on the personnel the quality of Nesta or Cannavaro, yet he has managed to prove that it is not crucial to have the best defenders in order to have the best defence. That is, his back four, notwithstanding a constant state of flux, has managed to defend superbly as a unit. Of course, Italy have not always been up against daunting opposition during the qualifiers, but remember how easily they were carved open by Slovakia at the World Cup. Addressing the defensive problems so effectively has been a signal achievement for Prandelli. However, his flexibility in changing formation from 4-3-3 to a 4-3-1-2 depending on the need has allowed this Italy side to maintain a shape with three solid points of references in midfield and attack: Andrea Pirlo, Daniele De Rossi, and Antonio Cassano. These three players, alongside Chiellini and Gianluigi Buffon in goal, are virtually guaranteed a place in the starting line-up. Further, similar to how Lippi assembled his team for the 2006 World Cup, Prandelli has used players of varying strengths around this nucleus, from Stefano Mauri to Giuseppe Rossi. The results have been better than most expected, and the culmination of Prandelli's hard work came to a sentimental point on Tuesday. The coach conceded that securing qualification at the Stadio Franchi, the stadium he called home for the five years he coached Fiorentina, was "a tremendously emotional moment." That is all he conceded. He was eager to refocus, regroup, and rethink for Euro2012, by stating that preparations for the tournament would begin in earnest now. 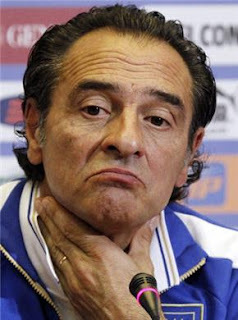 Characteristically focused, Prandelli, a year on, seems to have the same poise Lippi did before the 2006 World Cup. To expect the same result may at first seem wildly optimistic; however, judging by the confidence with which Prandelli's Italy play, that optimism may seem eminently reasonable next summer.